Finland) began and saw rapid growth. In fact, the expression, `it grows like Nurmijärvi' became a way the Finnish Americans for decades used to describe anything which expanded or developed with great speed. there was some dissension, and a splinter group started another congregation, affiliated with the National church. In addition to these two Evangelical Lutheran groups, there has also been a strong Apostolic Lutheran group. All three have possessed their own church buildings. In 1904 a temperance society, the Taiston Alku (Beginning of the Struggle) was started. Later, dramatics activity played an important role in the Farmers Club, 1915-16, while an independent gymnastics society, coached by Emil Kuitunen, was popular at the same time. Musical activity came under varied sponsorship: the local choral groups were affiliated with the churches, while a local brass band was independent, being started in 1913 by Hjalmar Bordlund and active for about three years. Finally, there has been a unique lending library of considerable scope, kept for years at the Kallio farm. 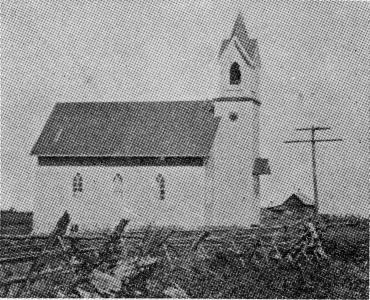 Finlayson's S. S. Church at Nurmijärvi.